I mean, if you think we'd let you get away with not finishing this... you don't give us much credit, do you Moka? What will Taka do now that Mufasa's refused to honor his promise? Will Uru find a way to placate our young pro/antagonist? Will Taka and Mufasa try to reconcile, or will the schism only grow deeper and more jagged? Bated breath. Playing hard to get, huh? Well, I'm not that easy to get rid of as my ex girlfriend found out the hard way. Every few days I'm going to break rules in this topic in increasingly obscene and blatant fashion, like a sort of pathetic attempt at ransom, until you at least write a one-paragraph (or heck, one sentence) conclusion. Double posting within a day (24 hours). Double posting is the act of posting in a topic and then posting again in that same topic before anyone else has a chance to post. Use the edit feature to modify your posts and avoid double posting. Accidental double posting (submitting the same post twice) is obvious to us and will not be counted as double posting. Ask us to remove the accidental double post and we will. Alright, you leave me no choice. You really want to do this? Time to bring in the big guns. Universal Rules wrote: Grounds for Ban: Being under 13 years of age and failing to properly fill out the COPPA form during registration. Az, you need to try posting memes. 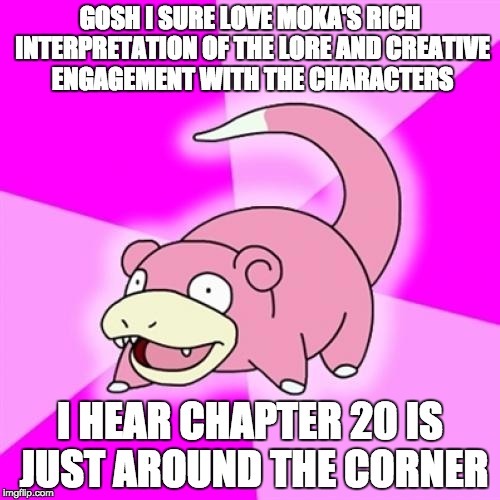 That always gets Moka's attention.